No, it’s not the one where Black Sabbath will be performing their last show. 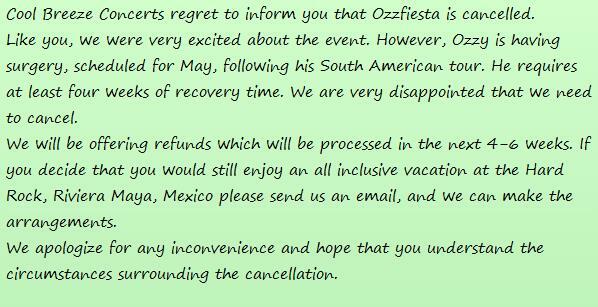 This Ozzfiesta takes place between May 27-31, at the Hard Rock Hotel in Riviera Maya, Mexico. The show has been cancelled since Ozzy will be undergoing surgery in May, and won’t be allowed to perform until his recovery. Black Label Society, Zakk Wylde (acoustic set) and comedians Jim Norton and Jim Florentine were scheduled to perform at the concert. We wish Ozzy a fast recovery free of post-operative complications, and hope he will be back to his full powers by the time of the farewell show.